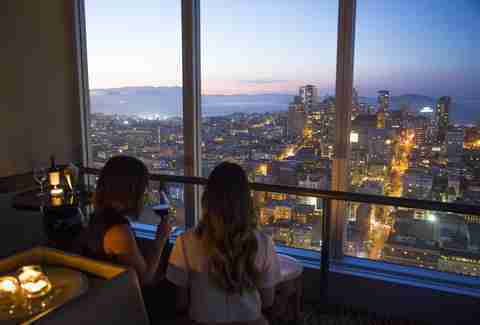 Listen, we know there are a couple of bars with truly amazing views in San Francisco. After all, great views are what happen when you put steep hills, tall buildings, and windows together in a city known for its beauty. 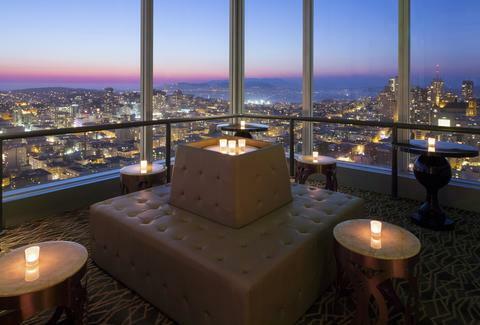 And despite what we’re about to say, Top of the Mark, The View Lounge, The Starlight Room, and The Cliff House are all incredibly worthy places to go when you need more than a cocktail to help you escape. 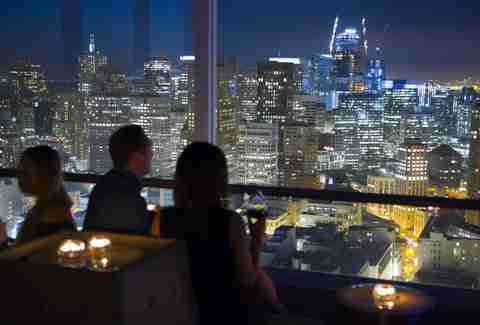 Still, as of this September, there’s a new bar in town that can confidently boast it has The Very Best Views in All of San Francisco: the Cityscape Lounge, located on the 46th floor of the Hilton San Francisco Union Square. To get to Cityscape Lounge, you’ll enter the Hilton (which -- fun fact! -- is the largest hotel on the West Coast) at 333 O’Farrell Stand go to the elevator bank for tower one (stay to the left of The Lobby Bar and then take a right). You’re greeted by stunning, Bay-spanning vistas as soon as the elevator doors open on the 46th floor. Prepare to not only be wowed, but to say “Wow” aloud. Seriously, if you somehow manage not to blurt out an exclamation of delight because of the breathtaking scene in front of you, you might want to see a professional. No matter where you stand inside Cityscape Lounge, it feels like you’re floating in the sky. 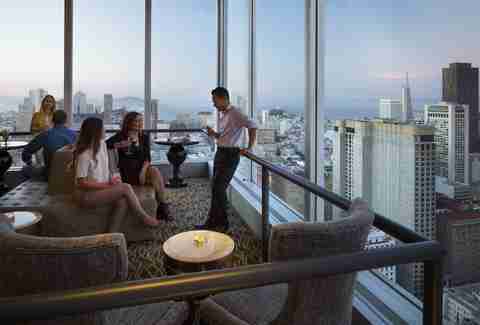 Its 360-degree views and 14ft floor-to-ceiling windows allow you to not just see all of San Francisco, but miles and miles beyond. Highlights include the Golden Gate Bridge, Coit Tower, the Transamerica Pyramid, Chinatown, AT&T Park, the Marin Headlands, Nob Hill, Oakland, and ships cruising around on the Bay everywhere you turn. You know, just a few small attractions that people travel hundreds and thousands of miles to see. The seats line the windows, which means wherever you end up, you’ll be thrilled with your view. But if you don’t want to be stuck looking at just one part of the city (life is so hard), you can always grab a seat at the bar. It’s elevated in the middle of the room, so that every time you turn your head, you’ll see something new. Just don’t be surprised if you end up with a crick in your neck and a twinge of vertigo. The best time to visit Cityscape is probably before sunset, so you’re able to watch as the sun sets and the city lights up. Of course, you’ll be doing all of this with a cocktail and maybe a few snacks, and we’re happy to report that Cityscape take its food and beverage program as seriously as it takes the view. 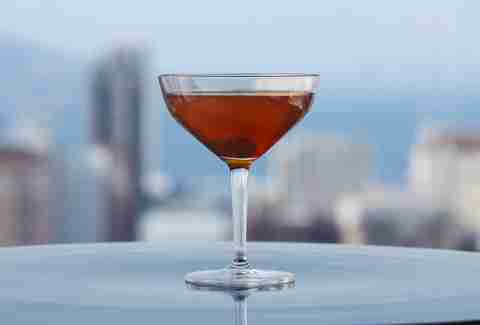 The signature cocktails are all named after SF and Bay Area neighborhoods and include options like the Nob Hill Manhattan, Noe Valley Old Fashioned, Pacific Heights (Martell Cordon Bleu Cognac, Cointreau, and squeeze of lemon), and the Presidio (Maestro Dobel Diamond Tequila, St-Germain, ruby red grapefruit, and lime). This is a hotel bar, so you can expect to pay hotel bar prices ($16-17), but there are plenty of $12-14 wines by the glass, as well as 17 beers on tap and by the bottle ($8-14). The food blew our expectations out of the water, with a menu of locally inspired small plates like Dungeness crab with spicy giardineria, natural tobiko and grilled brioche, and chilled prawns with a “cioppino” cocktail sauce. Cityscape also offers a snack we wish we could eat while watching every football game for the rest of our lives: Kennebec potato crisps with a black garlic-charred scallion aioli. 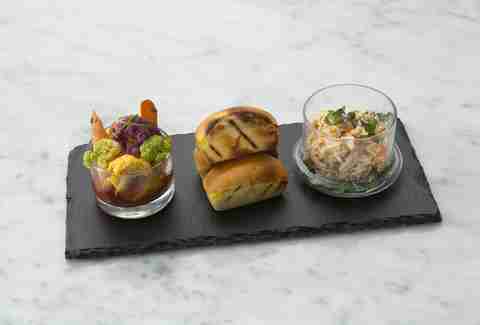 The food is reasonably priced, ranging from $7 to $17. More money to spend on drinks! Cityscape Lounge is definitely our new favorite place to bring out-of-town guests. And second or third dates. Or even to have a party (you can rent the corner lounges for groups of 20, or the whole space, which holds 350). That being said, don’t wait for a special occasion to check it out, because Cityscape Lounge is truly a one-of-a-kind experience, and there’s no day like today to see the city you love from new heights. Daisy Barringer grew up in San Francisco and she’s always on the hunt for a place with an amazing view. Tell her your favorites on Twitter @daisy.